This warm, lightweight winter parka for a man was sewn from ninety-three Arctic ground squirrel skins. The maker used whole pelts, turning the bellies toward the inside of the garment. 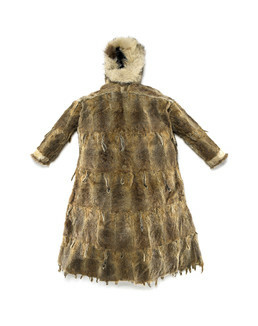 The hood ruff is wolf, and the cuffs have bands of white caribou and brown wolverine fur. A woman’s role as clothing maker had social and spiritual meanings. The designs she sewed expressed personal and family identity, and well-made, beautiful clothing helped her husband as a hunter because it pleased the animals. A fine parka demonstrated her sewing skills as well as her husband’s success as a provider.